Our crews use SERVPRO cleaning products and a 3 part process which includes sponge cleaning, wet washing, and polishing. The SERVPRO of S&E Stark County team has the equipment, training, and fire and soot damage experience to restore your home and belongings to pre-damage condition. We are capable of handling jobs of all sizes. This means small residential homes or large commercial properties. We were called to this large water loss in a commercial building in Canton, Ohio. Our warehouse is stocked with SERVPRO equipment ready for any size disaster. Our crews are available 24 hours a day to help make your water damage "Like it never even happened." This is a photo of SERVPRO of S&E Stark County office managers Tracy and Rhonda. Both Rhonda and Tracy are dedicated to their job and work long hours to ensure safety of our employees and customer satisfaction. Tracy has been with the company over 20 years and Rhonda over 12. If you have any questions about your fire or water claim they are here to help you! When a storm hits your Alliance home or business, you need help immediately. Our crews will quickly respond to help prevent secondary damage and help reduce restoration costs. Call us, day or night, at 330-823-4088. Our crews are available 24 hours a day to help you clean up and restore your home from a water, fire, storm or mold damage. Our office team is ready to take your call now. Call us at 330-497-4600. SERVPRO of South & East Stark County has the ability to roof tarp and board up homes and businesses. This home had a tree fall on the roof and puncture a hole in the ceiling. The team came out and removed the tree, tarped the roof and dried out the structure after the rain water damaged the home too. A huge water loss occurred at a business in New Philadelphia, Ohio. Our estimators worked together to put together an estimate and plan of action to get the crews working to put the business back to preloss condition. 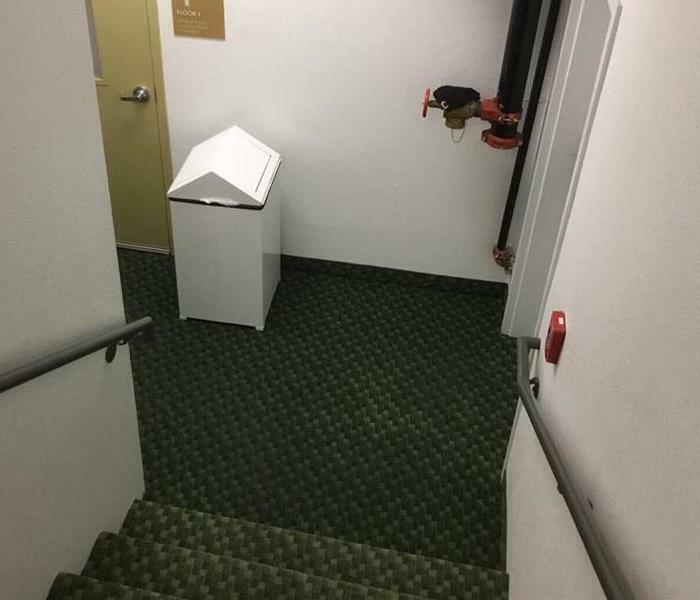 We recently were called to cleanup a large water damage at a Canton Ohio hotel. Two floors were affected and suffered a major water damage due to a sprinkler pipe break in the ceiling. Our crews quickly responded to begin extracting water and start the drying process. Mold damage occurred on this living room ceiling due to a water damage that occurred in the home when the homeowner was out of town. If you experience a water damage in your home, it is important to extract and dry out the your home or business as quickly as possible. Mold can begin growing within 24-48 hours of the water damage occurred. This is just a small area of the SERVPRO of S&E Stark County warehouse that stores some of the equipment we need to ensure your storm damage water loss is dried completely. In this picture is a shelf full of air movers. Our SERVPRO of S&E Stark County team quickly responded to this water loss to cleanup. We quickly remediated the water and than began the drying process placing our equipment. It is critical to make sure all of the water is extracted and that the right amount of equipment is put in place to dry out completely. SERVPRO of S&E Stark County has large trucks that are equipped with all necessary equipment to help dry out homes and businesses due to water damage. No job is too big or too small for our crews! This is an after picture of drywall that was removed after a pipe break. We had to remove the ceilings and walls, since the water destroyed the materials. SERVPRO of S&E Stark County has the expertise to ensure drywall is cut our properly and drying equipment placed to dry all the wood studs to pre-water conditions. 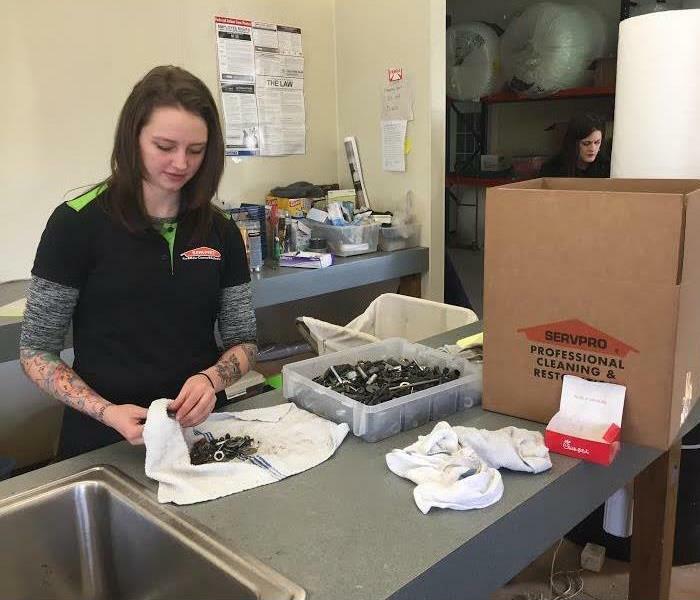 After a severe fire, the SERVPRO crews have to pack out personal belongings to clean the contents at our SERVPRO of S&E Stark County warehouse. If you have personal items that were damaged in a fire, we can help and restore your items instead of replacing them. Our crew arrived onsite to find mold found under a kitchen sink in Minerva, Ohio. If you find mold, there is an excellent chance you have a moisture problem. In order to deal with the mold, you have to deal with the moisture problem first to make sure that the mold doesn't grow back. The homeowner had the kitchen pipe fixed as we were able to remediate all the mold. Mold has the ability to grow quickly especially if the home hasn't been occupied for several months. When our SERVPRO crew arrived at this home in Beach City, Ohio there was so much mold growth everywhere that we ended up cutting out and removing the contaminated wall. Moisture is always a problem is bathrooms that do not have proper ventilation. Sometimes the dampness will lead to mold growth. Our crew was called out to remediate the mold in this bathroom in Navarre. We used a HEPA filtered equipment to prevent the spores from contaminating other parts of the home. 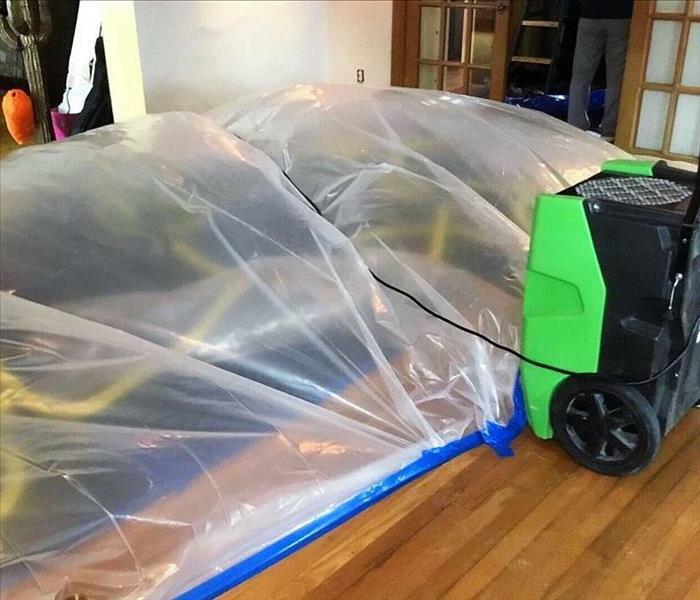 Our technicians use a variety of drying techniques to dry out a home after a water damage. Our technicians are highly trained in the dry out process. This piece of equipment helps to get air movement in the targeted areas in the wall. Fire creates a mess with insulation, building materials, sooty stains, odors to the water that the fire department uses to put out the fire. The crews were able to put the homeowners at ease when we began the clean up and restoration process to preloss condition. 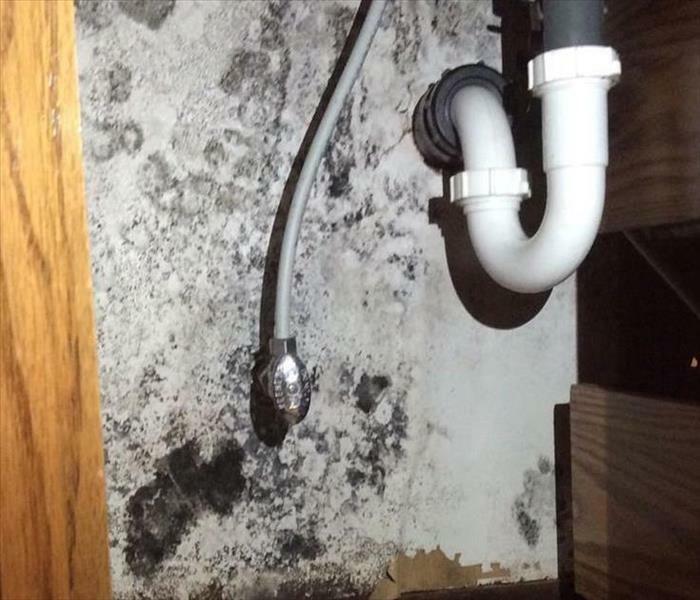 If conditions are right, mold can grow anywhere and it affects everything it touches. 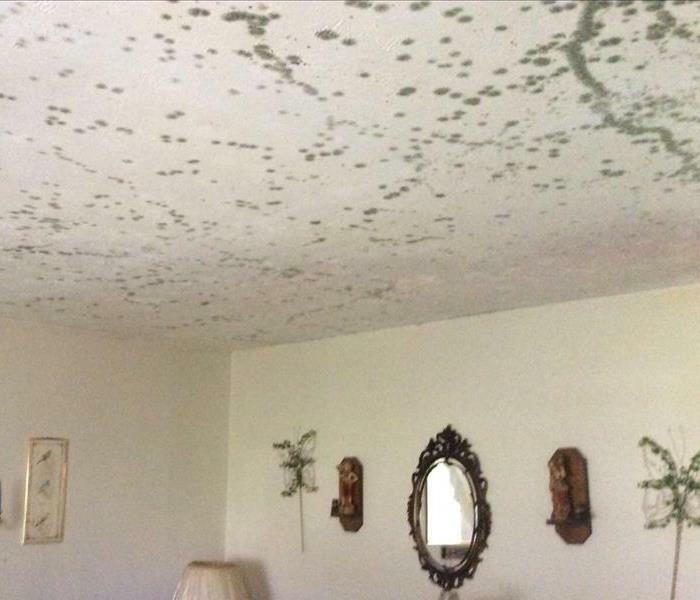 If you have a mold problem, call the crew at SERVPRO of S&E Stark County to remediate it. The fire in this home in Louisville Ohio caused major structural damage and the smoke damage was extensive throughout each room. The cleanup of charred debris and placing our hydroxyl equipment helped clean the smoky air of particles. Our warehouse is fully stocked with new equipment for the next storm that comes through Stark County, Ohio. 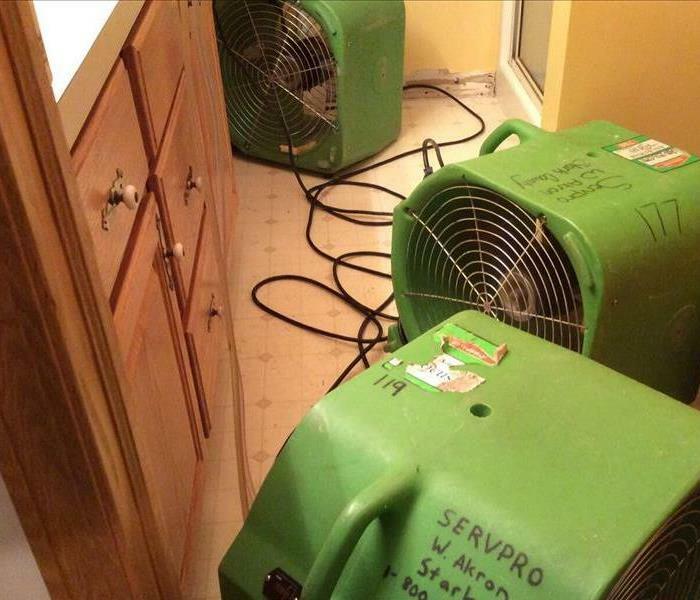 SERVPRO of S&E Stark County is available 24/7 for water damage cleanup and restoration. This is a picture of the different equipment we use to dry out a water damage. There are air movers that we place to create airflow across the floors and walls which accelerates the evaporation and moisture. This is a picture of our injectadry equipment that we use on these hardwood floors in Navarre that have been water damaged from a pipebreak. We use a containment to restrict the airflow to the exact area that needed to be dried out. Cutting only a portion of the drywall to treat and mediate a storm damage is way more cost effective than taking down the whole wall. 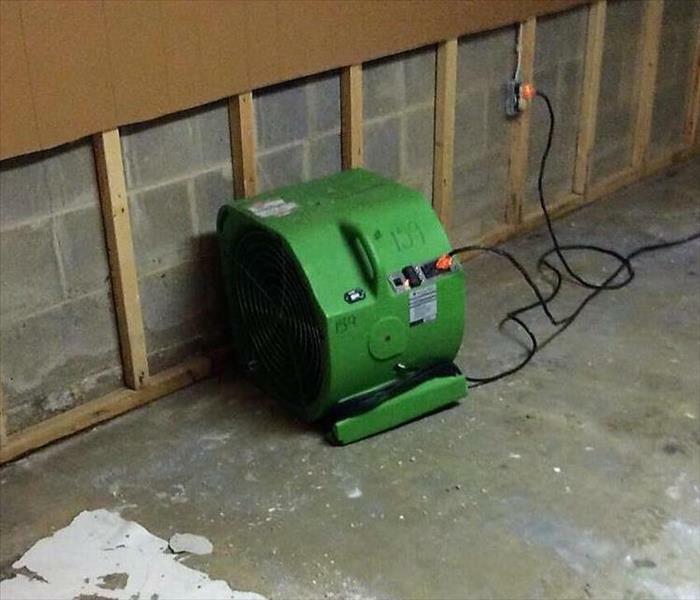 Call SERVPRO if you have a flood in your basement due to a severe storm. One of our SERVPRO production crew members wore PPE and a air respirator to do a sewage cleanup from a toilet overflow in Brewster, Ohio. Call SERVPRO of S&E Stark County for your next water cleanup. A tree had fallen into this home after a severe storm came through New Philadelphia. We helped the homeowners by placing equipment to dry out the structure from the rain and then our construction crew rebuilt their home to preloss condition. We arrived at this home in Waynesburg to find mold growing in the rafters in the basement ceiling. We can remove all types of mold quickly and efficiently. Call SERVPRO of S&E Stark County today for a mold remediation estimate. 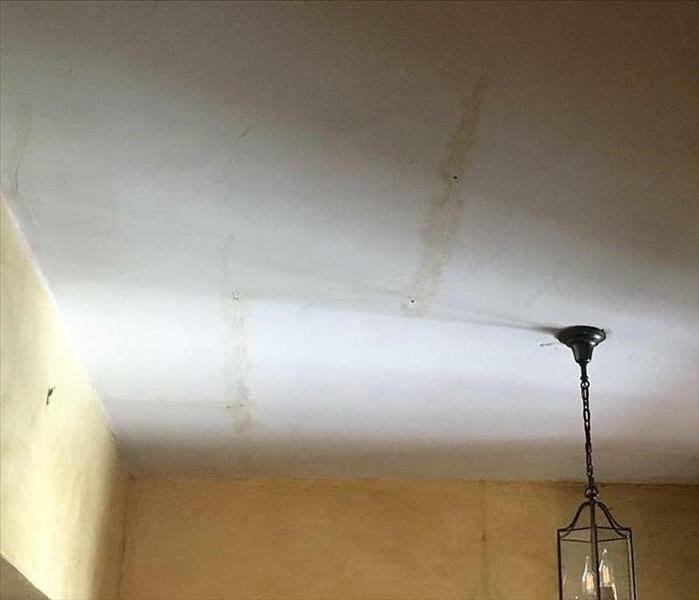 This ceiling is showing water damage from a pipe that had burst. 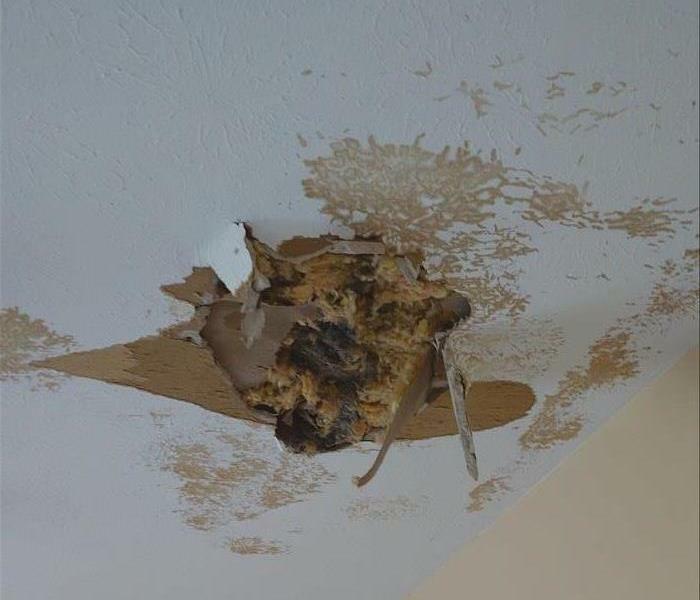 The water damaged the ceiling and also caused damage to the lower floor area in a home in Navarre Ohio. This was a ceiling that had been damaged in Brewster, Ohio. There was significant damage to the ceiling and floors due to the pipe that had burst. Call SERVPRO of S&E Stark County for your next water damage cleanup. This was damage to a ceiling from a fire in East Canton. The fire caused damage to multiple rooms in the house. The owner was very happy that we were able to restore their belongings. 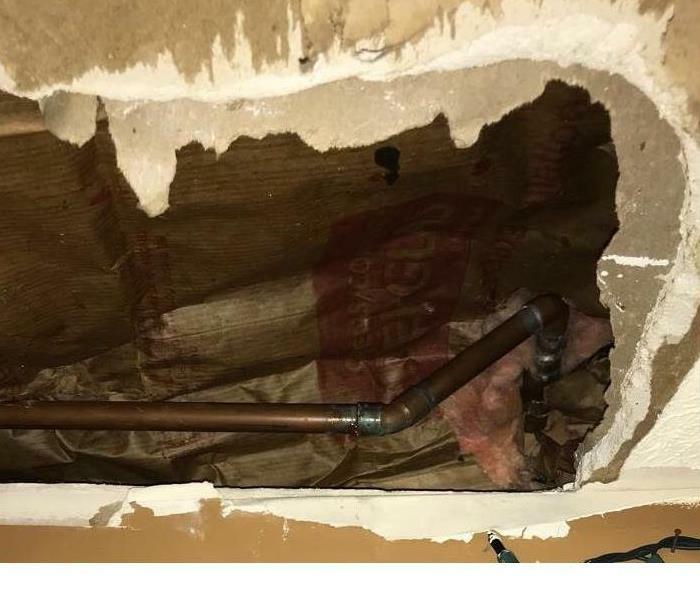 When pipes break and flood entire floors it can be a nightmare to building owners. That is what this retirement center was facing when they had a major water damage in Louisville, Ohio. The crews at SERVPRO of S&E Stark County arrived on scene and immediately began the restoration process. This was the aftermath of a house kitchen fire in Navarre, Ohio. When we arrived on the scene there was significant damage throughout the house. 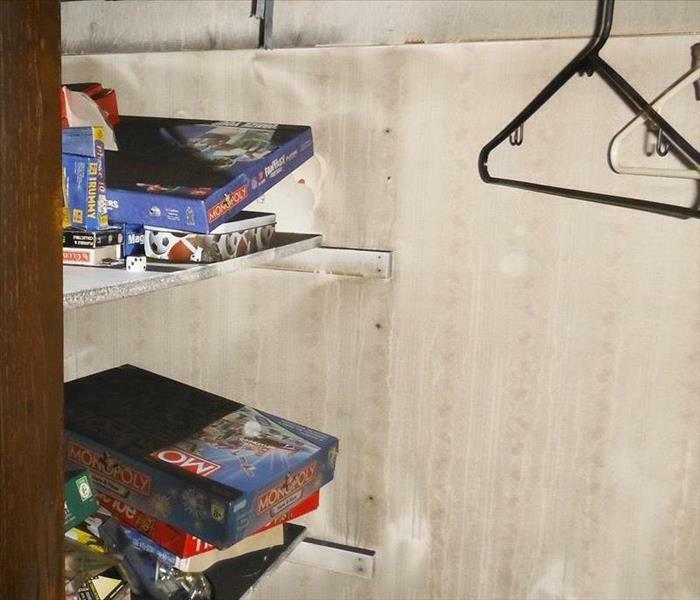 The picture shows the soot damage in the hall closet. The SERVPRO crew was able to cleanup all the smoke and soot damage. 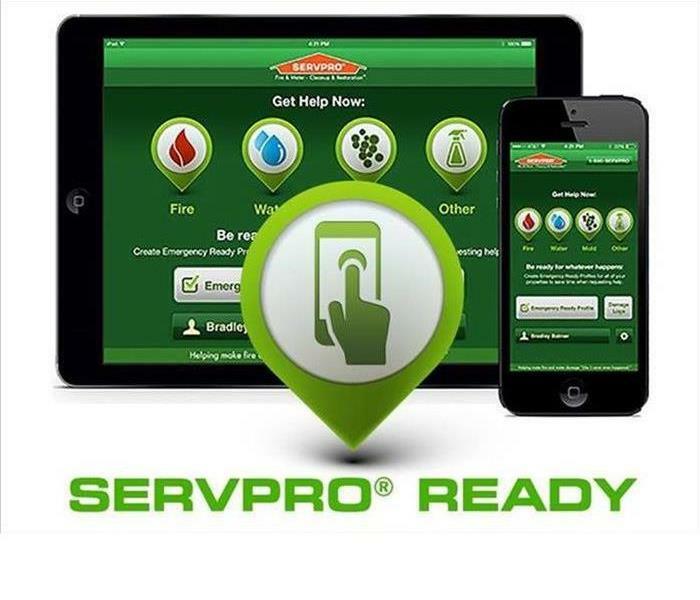 When you have a water damage to your home or business the SERVPRO of S&E crew will mitigate the water. Your floors and walls may look dry, but they will still be wet to the touch. If moisture is detected we will place industrial air movers and dehumidifiers, to remove water retained by building materials and other hard-to-access moisture. They will carefully monitor the progress using the moisture meters until the materials return to acceptable drying goals. 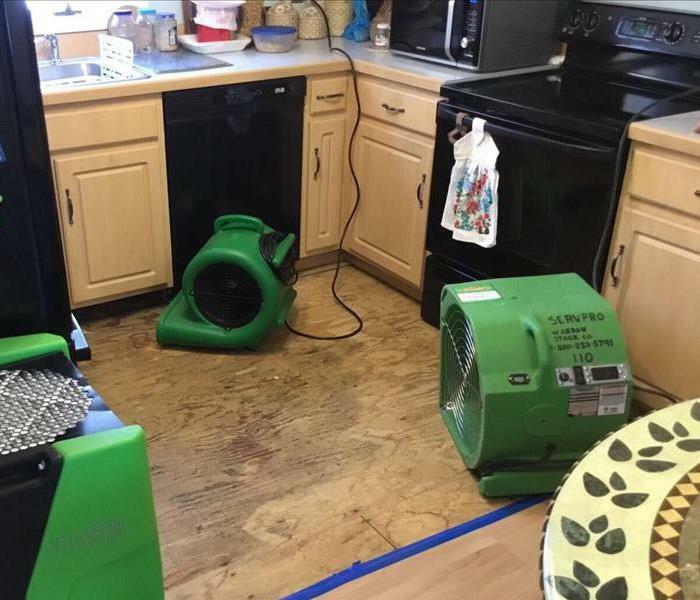 If you have a water loss in your home or business, call the professionals at SERVPRO of S&E Stark County for immediate assistance to dry out and restore your home at 330-823-4088. There is no such thing as a small emergency when it threatens to shut down your business. Preparation is a key component for making it through any size disaster, whether it be a small water leak, a large flood or a fire. The best time for planning for such events is not when the event happens. Call SERVPRO of S&E Stark County for an Emergency Ready Profile (ERP) to be done at your business which will help minimize business interruption. An ERP is a quick reference guide of critical information of your building, so that our team can effectively and quickly cleanup and mitigate your business.. Call us today at 330-823-4088. When you are dealing with water damage in Carrollton Ohio, immediate action is crucial. Even small water damages have the potential to cause serious structural and indoor air quality issues over time. It is often the water you don’t see that can cause the most damage. We recently were called to a home in Carrollton Ohio where a toilet line had leaked for several days damaging the flooring, vanity and baseboards in the home. Call SERVPRO of S&E Stark County 24/7 at (330) 823-4088 if you need immediate water cleanup at your home or business! Did you know that SERVPRO of S&E Stark County are trained to safely and effectively remove the following hazardous substance? Call SERVPRO of S&E Stark County 24/7 at (330) 823-4088 if you need immediate cleanup at your home or business! 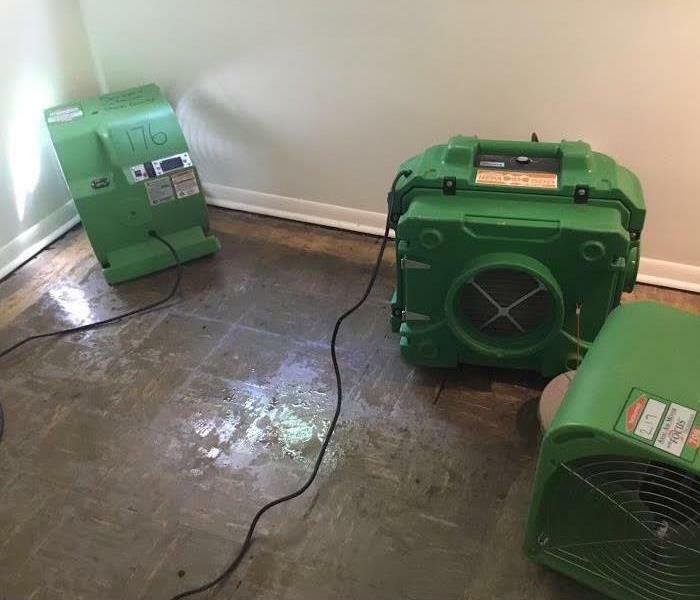 When you are dealing with water damage in NE Ohio, immediate action is crucial. SERVPRO of S&E Stark County will respond immediately. We use advanced equipment and techniques to remove the water quickly. We also closely monitor and document the drying process to verify your property is dried properly and thoroughly. If you suffer water damage in NE Ohio or the surrounding area we are here to help. Call us 24/7 at (330) 823-4088. SERVPRO of S&E Stark County office and trucks. With over 1,650 Franchises nationwide, SERVPRO is a leader in the restoration industry and its professionals are faster to any size disaster. SERVPRO of S&E Franchise is available 24 hours/7 days a week and are ready to restore or clean your property.